The Chrysanthemum has been cherished in Japan for a long time. The flower called Kiku-no-hana or Kiku in Japanese is native to China and was originally imported to Japan as medicine from China. Kiku is said to have come to Japan in the Nara period (710-793), and in the Heian period (794-1191) the royalty came to love the flower because they believed it had the power to prolong people’ s lives. Later in the Kamakura period (1192-1333), Kiku was used as the emblem of the Japanese royal family, but it was 1869 in the Meiji (1868-1912) that Kiku with 16 petals was officially adopted as the symbol of the Japanese royal family. In the Edo period (1603-1867) Kiku cultivation reached its height, and varieties of chrysanthemums were introduced and became popular as potted plants. At that time skillful techniques were developed for displaying and enjoying chrysanthemum flowers. At the end of the Edo period, some gardeners living in Edo (now Tokyo) made “Kiku Ningyo” and displayed them for the citizen. “Kiku Ningyo” are the dolls made of chrysanthemums representing famous features in the Japanese historical tales.Even today the dolls can be seen at a large park in local areas. The display is held as an autumnal big event. 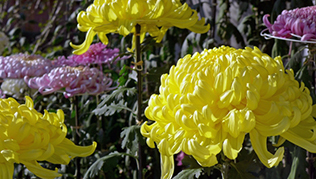 Plenty of pots of the chrysanthemum “tree” which has more than a thousand flowers are also exhibited in some places. Shinjuku Gyoen National Garden in Tokyo is famous for its kind of exhibition. 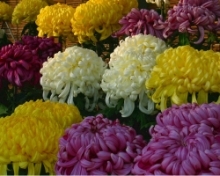 You can enjoy there the beauty of chrysanthemums from November 1st to 15th. During World War II, Ruth Benedict, an American female anthropologist wrote the book entitled “The Chrysanthemum and the Sword” after having done a lot of research for militaristic purpose. The book was published in 1946 with the aim of getting better understanding of the cultural patterns and the society of Japan. ”The Chrysanthemum” in the title of the book represents the emperor and Imperial House of Japan. In Japan like other countries, white chrysanthemums are symbolic of death and often used for funerals or on grave. There are edible chrysanthemums. They are eaten as a vegetable and their good fragrance can be enjoyed in autumn. Would you like to try a bite?